CCleaner 5.42.6495 (64-bit) crashes every time I try to use it. Could use some guidance. Attached debug log Also attached file Report.wer from C:\ProgramData\Microsoft\Windows\WER\ReportArchive\AppCrash_CCleaner64.exe_<long hexidecimal string>\ (not generated at same time as attached debug log). Crashes happen when I press "Run Cleaner" in the Cleaner, independently of what is checked off. It'll crash when only "Empty Recycle Bin" is checked, and when only "Game Explorer" is checked, but no crashing when nothing is checked. Does not crash when "Analyze" button is pressed. Tried uninstalling CCleaner, deleting all associated files and registry entries, and reinstalling. Not helpful. Kaspersky Total Security, and nothing else. Disabled it and tried Ccleaner again, still crashes. But it was a good idea, I have to disable Kaspersky when I install a new version of the VirtualBox Extension Pack. Tried again 9:41pm PST, same result. I have same problem on CCleaner 5.42.6495 on W10 64. Just started yesterday. CCCleaner launches, but when I run "run cleaner", get the windows message "CCleaner has stopped working. A problem caused the program to stop working correctly. Windows will close the program and notify you if a solution is available"
I also have Kaspersky Internet Security. Tried uninstalling and reinstalling CCleaner. Ran avast uninstall just in case avast got installed with CCleaner causing a conflict with Kaspsersky. Restarted. Made sure Kaspersky definitions database was all up to date. Then reinstalled CCleaner again. No luck. Weird. Have been using CCleaner over a decade and this is the first time I've had a problem. Thank you for the update. I've reverted back to 5.40 (downloaded from https://download.ccleaner.com/ccsetup540.exe). 5.41 also works, but I don't like the functionality changes to CCleaner introduced in 5.41. Let me know when this is fixed. Those are quite big changes. Thanks everyone. I reverted to 6.41.6446 (64) All is well now. Hopefully Kaspersky conflict will be resolved in a future release. Try setting the option as shown in the attached pic. I started having this problem when I installed Kaspersky Internet Security 2019 V19.0.0.1088(a)RC and this stopped the crashing of CCleaner 5.42.6499 when "Run Cleaner" is executed. SiliconMan01, thank you! Your solution worked for me. However, I have the purchased version, so my option was in the same place, but under "Cleaning results level of detail," third radio button choice. Thank you again!!! This issue disappeared when I installed 5.43. I'm also running Kaspersky Internet Security 2019 V19.0.0.1088(a) . Thanks for the fix! The fix is in the next version, due before the end of June. Thanks for the fix. My favourite cleaner now works as it should.. What does save to ini file do as I now have that checked. Today I ran into this problem: When selecting Run Cleaner > Continue, the app automatically closed without running the cleaner. Other functions of the Cleaner worked; however, not that one. 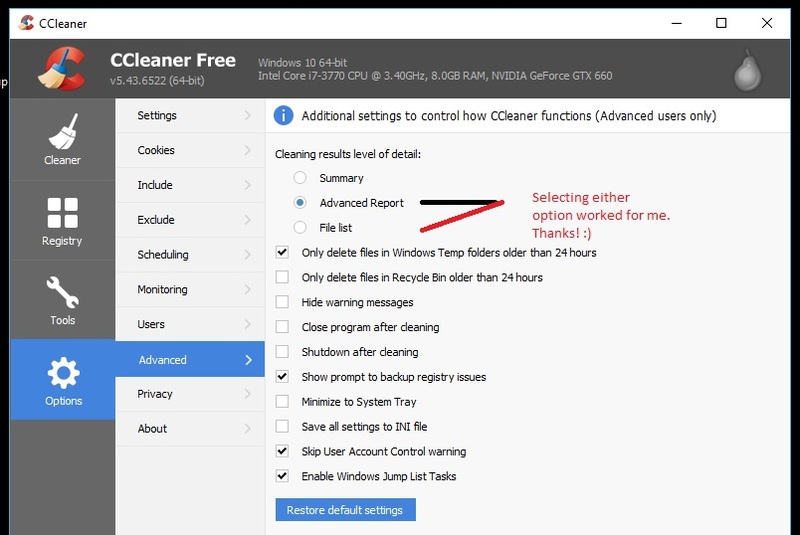 I tried the solution posted above on May 22 by siliconman01, i.e., I changed the Cleaner Results option to a file list (from summary). Today's release has a tentative fix for this. It would be great if anyone would confirm it has worked (we've not been able to reproduce in-house). I updated to 5.44.6575 today as well. And it continues to crash. Kaspersky 18 full license. However, the workaround as explained above does work fine.